I don’t read much fiction. In fact, I tend to limit the genre to vacations only. Thus, in planning a recent trip to Cape Cod, I began looking for a book to read. At first I wandered through Barnes & Noble, waiting for something to catch my eye. On one of the tables, I discovered Judy Blume’s newest release, In The Unlikely Event. I picked it up and thumbed through it. It looked good, but it was too long for me to read in four days. Still, my search had been narrowed. 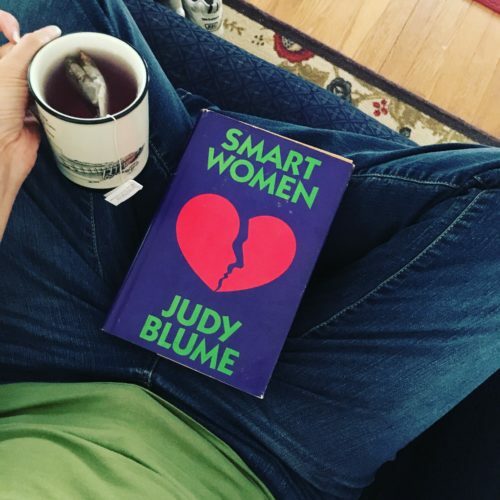 I love Judy Blume, and I decided to seek out her book Smart Women, as I hadn’t read it yet (or so I thought), and it was the perfect length for my trip. It took some time for me to find Smart Women somewhere other than Amazon.com, but I finally located a copy at a local used book store*. I bought it and toted it to Massachusetts, where I began reading and discovered a few familiar lines in the text. Overall, I didn’t know the story, but there were bits and pieces that I recognized. It’s an older book- originally published in the early 1980s, and I think I must’ve picked it up at some point before I became the woman I am now. Perhaps I skimmed through it, not identifying with half the characters because I had yet to have a comparable life experience. As a result, it hadn’t been a memorable book. Smart Women centers around four main characters: two divorcees (Margot and B.B.) and their daughters (Michelle and Sara). The story is set in Boulder, Colorado where Margot and B.B. met after Margot moved there with her children, leaving her remarried ex in New York. The two women enjoy a friendly relationship, sharing occasional lunches and jazzercise classes with their mutual friend, another divorcee named Clare. Things get complicated when B.B.’s ex moves to Boulder from Miami. He made the move in an effort to spend more time with Sara, but B.B. isn’t used to sharing her daughter to the degree that Andrew and Sara request. To make matters worse, Andrew begins dating Margo. The presence of this new man in town creates a bit of confusion for everyone. Actually, that’s an understatement. As always, Judy Blume didn’t fail to capture the life and depth of her characters. From the perspective of these Smart Women, I learned their hopes and fears. I learned how they experienced marriage and divorce, their frustrations within their families and their secret fantasies. Their stories tell of old lovers, shared lovers, new love, second guesses, inappropriate advances, blended families, breakdowns, tragedy and resilience. Smart Women is a book about life after divorce and all of the freedom and challenges that come with it. I recommend it to all smart women. * If you get the chance, visit Cupboardmaker Books in Enola, PA. Not only do they have a ton of titles, but they also have cats. Posted in children of divorce, divorce, family and tagged divorce, family, Judy Blume, life after divorce, novel, Smart Women.